I don’t normally talk about this kind of stuff, but SV has got a special running on it’s Drivers, check it out. For all the Aussie Readers, Geoff (of Data Down Under) has sent an email out with a link to his site, where he’s got the specials running too, obviously. Here’s the link. I’m going to scramble out on a limb like Toto the Monkey. Robert Scoble has mentioned (in a good post by Louis Gray here) that he’s scared about people not understanding the many Social Services around today (please correct me if I’m wrong). A good tool will solve this. FriendFeed (and the others) should invest in the creation of a Tool that will bridge the gap of their Service and the public awareness. For me, the Tool that caused me to _get_ FriendFeed was twhirl. It allowed me to see what was happening, from a desktop app. I think the web services need to examine more carefully the importance of a desktop app to bridge the gap between them and the world. It doesn’t have to be a desktop app, but that’d be the first context I’d pursue. Should the Social Web Services spend more time on a Tool to bridge the gap between them and the general public? And should they care? Work has been flat chat lately. We’re gearing up for the yearly International Conference. The big system I’ve been working on since before the Reformation (i kid, i kid) is being displayed for all to see and play and break. Also am working on a web system for one of the other business units. Have to brand it up for the conference. Shouldn’t be too much trouble, it’s just the time that grieves me so. Have gotten Chapter Navigation into Taels. Awesome. So now you can read it like a book, going from chapter to chapter without too much trouble. Links are top and bottom. Works better that way I think. Here’s an example. Almost finished the first episode of "The Plastic Detectives". Just have to add some filler background music while there’s no dialogue. It runs a couple of minutes long, and the theme song takes up probably as much time as the story. Ha ha. It’s so awesome seeing all the parts of putting something like this together. We recorded the song today, the kids don’t really know it yet, but it’s classic all the more for their almost getting the words. So it should be done tomorrow night I think. Will go up on Taels. I might wait till Monday to release it proper. Or at least to start making noise about it. 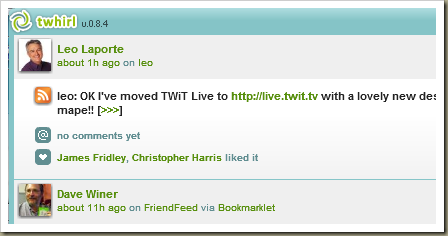 Twhirl, Twitter, Friendfeed .. Can It Work Again? I’m not referring to the Services themselves working, but to MY use of them. 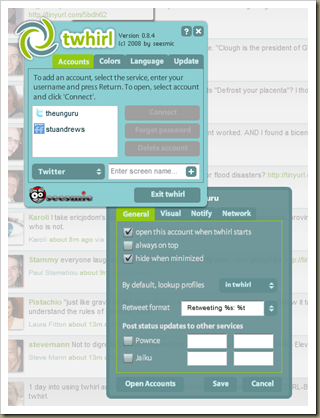 My last journey into the world of Social Networking ended when Twitter stopped it’s jabber (and thus Gtalk) support for me. This kind of waned all other interests. Now I’m using Twhirl, and it seems pretty cool. My biggest gripe so far is that CTRL-Backspace doesn’t do what I want it to :). The Config windows are simple. Twhirl runs on Adobe Air, and looks .. "air-ee". 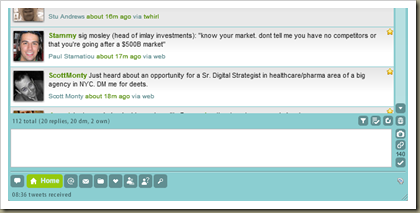 It allows me to follow Twitter posts and FriendFeed conversations. Also has support for other Services. Considering it’s now owned by Seesmic, it supports them too. So maybe it’s back in my bloodstream. In my routine. We’ll see. I’m a few episodes away from finishing Season 2 of Buffy. What a ride so far. It’s kind of wierd watching a show that has been over for so long. But then it’s not. I read books that are older, over and over again. It’s the story-telling that really has me gripped. The turns, unexpected and .. expected. The huge amount of foreshadowing, and backshadowing (not really a word) too. References to things gone past. It’s very cool. I’ve been sick the past two days, which meant a lot of lying around feeling sorry for myself. Thus was able to watch a stupid number of episodes of Buffy. Bob Z has posted on the SV blog about the latest version of Clarion 6. He also mentions that he’ll be posting again shortly about the AppGen and new stuff in Clarion#. A lot of people will be interested to hear news on the AppGen. It’s going to be a big step for the new Clarion products, and I’m sure the SV guys are all sweating on getting it right.